friends, using natural products from the beehive. Pet Care There are 5 products. Rashes, itching, unpleasant odours ... your pets ear hygiene is a real daily concern. 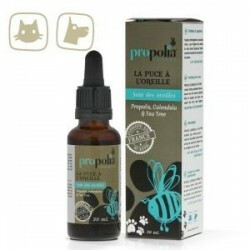 For your pet’s care, Propolia® o­ffers all its expertise in combining Propolis and Calendula for a natural protective action. Thanks to the healing action of the all-natural ingredients, the Pet Balm for Paws and Skin can be used on treating skin and paws for your four-legged friends. 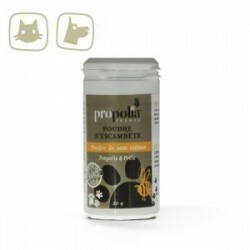 For itching, rashes and other ailments, give your pet the softness and natural action of Skin Care Powder. Thanks to its powder-dispensing applicator, you can finally take care of your pet's skin and well-being! Skin injury? Use the protective and purifying reflex of our Skin Cleansing Spray! 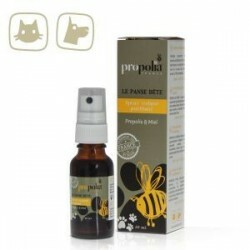 Highly concentrated in Propolis with purifying action and Honey with soothing properties, it forms a 100% natural protective film on the skin.